I got Larry Marshall right as well. As I remembered, he was both the Eagles kick and punt returner – a bit unusual, as teams usually use two different players for these roles. He served this role for four seasons (1974-1977). According to pro-football-reference.com, he ranks #58 all-time for combined return yardage, though never scored a touchdown in his career. He wore #22 though, not #44, though he did wear #44 in final season on the Rams in 1978. He hardly played that year, and didn’t return any kicks or punts, so that seems like a lucky coincidence. Still, in the extensive game coverage provided by the Bucks County Courier-Times (and the coverage really was extensive – multiple stories spread over two and a half ad-free pages; they sent two reporters and a photographer) Larry Marshall wasn’t mentioned once. Equally remarkable is that I never appreciated, or reflected on, the fact that these were the Super Bowl Champion Pittsburgh Steelers. 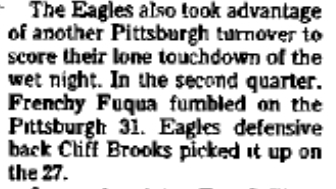 Terry Bradshaw played in this game, as did Lynn Swann, Franco Harris, Rocky Bleier, Jack Ham, L.C. Greenwood, even late-career John “Frenchy” Fuqua, famous for wearing platform shoes with water-filled plexiglass soles containing live tropical fish. I lived in Pittsburgh for 10 years, and being able to say I saw these guys play – in a hurricane, no less, would have come in handy in any number of barroom conversations. So it wasn’t as if I was actively reworking or embellishing this memory over the years. Rather, I don’t believe I gave it any thought at all between 1976 and 2011, when it popped back into my head when Tropical Storm Irene hit upstate New York. So, contrary to all expectations, I now have better confidence in the veracity of what I remember. And so those times when I remember being called to the TV, or having TV shows interrupted, for coverage of a live moon-rocket launch or splashdown, which must have been at age 5 at the latest? I’m saying that is real, even though my professor convinced me that I was probably just remembering some documentary about the Apollo program I saw when I was 9. Still, there are those times when I get together with my siblings and we can’t even agree on the names of the cats we lived with, and you realize that memory is truly a slippery thing. And this is why I made these posts – because of that slipperiness, because just looking up all of this stuff carried the risk of changing what I remembered. I didn’t want ten years from now to “remember” Terry Bradshaw immaculately weaving a pass through the raindrops to Frenchy Fuqua, seated comfortably underneath the upper deck overhang at the still-newish Veteran’s Stadium, at what would turn out to be my only NFL game. Why did i comment on part 2 instead of part 3, when i had clearly read all the way to the end prior to commenting? Hmm, another mental mystery.